42k and beyond: Hi-Tec and Hi-Performance. In the last few weeks I have been trying out the new Hi-Tec V-Lite Infinity adventure shoe in shocking green and silver (Stunning looks). 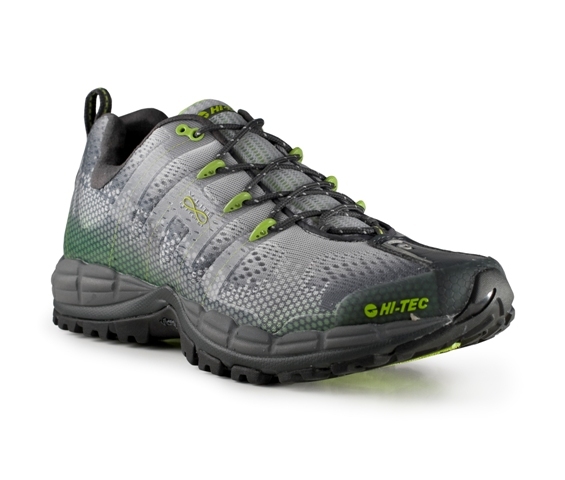 A shoe that was promoted by Hi-tec in their running on water video (review by myself in July) and now a permanent fixture in my trail runs too. My initial thoughts were quite reserved, as the shoes arrived ½ size smaller than I usually take but I was surprised at the great fit and feel of the shoe, and that they still seemed loose rather than tight. They feel incredibly light and with a very good Vibram Outsole they took to the trails, fields and road with little effort and maximum grip (yet to be tested in the muddiest conditions). But it’s the seamless mesh (that Hi-tec call SUZE), which is a single piece mesh providing protection, support and breathability, as well as reduced stitching that really worked for me! This added to the comfort and still kept the shoe light, which combined with the Hi-Tec "ion" treatment for quick drying and water resistance meant the water uptake was minimal and what was taken on board was quickly expelled. If I was to be picky about anything it would have to be the laces, understandably thin to stop them from absorbing water, but because they are thin it is hard to do a tight enough knot to stop them from coming un-done on a long run - best answer is a lace lock, which should come as standard - other than that these Hi-Tec Trainers are spot on and will work wonders hopefully as the winter progresses. 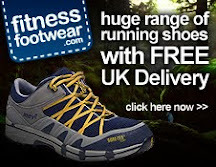 For more about the shoe visit http://www.fitnessfootwear.com/ - a great company who are supporting me for the 10 million metre challenge, and keeping me on my feet!!! Hey they look pretty good. Might have to try them myself.